​My sketches became an animation for a TV commercial for Junction Art Festival with a soundtrack by Noah Symons of Great Earthquake, and produced by CBphotofilm. I believe that it captures the lively, happy atmosphere of the Festival. I hope that many people see the lovely TV commercial and will like it. I have been so excited to work for on the TV commercial because this is the first time I’ve done a project like this and it’s also the first time I’ve done collaborative work. Alison and Laura from Junction Arts Festival, CBphotofilm and I had our first meeting in a beautiful room with gorgeous chandelier at the Junction Arts Festival office in Albert Hall. Everyone seemed excited and had lots of ideas for the commercial. 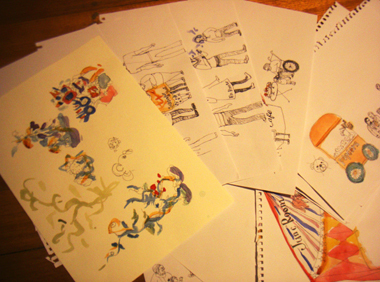 After the meeting, I was given a long list of images to draw. Specific and iconic buildings of Launceston were required as well as the images of art projects in the Festival. I drew the Clock Tower, gate of City Park, Albert Hall and so on. I know these buildings well as I have been living in Launceston for three and a half years, however, my memory was not clear enough to draw these buildings, so I decided to go out to the city. I walked around the city with my sketchbook, and drew its scenery and buildings. I had a coffee break and did more sketches of the city and people at a cafe. In the end, I drew and painted a lot of images for the commercial. There is a mountain of art pieces in my room. Since drawing all these sceneries and people of Launceston, I felt that I’m more connected to city. I believe that the animation create a good feel about Launceston as well as Junction Art Festival. Please check our TV commercial. You will like it.